Nina Nomi Jewelry was formally founded in 2000 by Maureen Shull. Maureen got her start just out of college when she started creating beautiful pieces of jewelry as a hobby. After many years of teaching high school and advising high school publications, she became involved with her former hobby and started selling the one-of-a-kind pieces she was wearing to friends and co-workers. The demand for and enjoyment of her jewelry was immediate at local art & craft festivals. After practicing as a Chiropractic physician for 30 years in Miami, Gary joined Maureen in her artistic venture. With your enjoyment in mind he now uses his hands to create fine pieces of beautiful jewelry. After attending the International School for Jewelry in Jupiter, Florida, Gary became intrigued with the versatility of Precious Metal Clay and decided to specialize in this area. He has studied under Celie Fago, Barbara Becker Simon and Ken Devos and received his certification at the William Holland School for Lapidary arts in Young Harris, Georgia. Although this was the initial thrust, we now include traditional fabrication techniques such as roller printing, hammering, reticulation, and patination. After many years as professionals, Gary and Maureen changed direction in life. They both now enjoy traveling the country in their motor coach to display their jewelry in various top art festivals from Miami to Seattle. 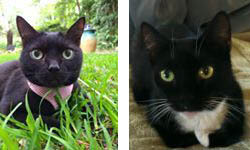 They are accompanied by Nina and Nomi, their two Humane Society cats, and their artistic inspiration.